R'n'B singer songwriter Jason Derulo has rocketed straight to the top of the singles chart with his new release Don't Wanna Go Home, the Official Charts Company said. It is the second UK number one for the 21-year-old following on from last year's In My Head. 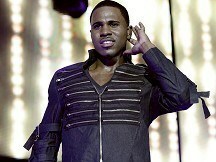 Derulo, from Miami, started his career writing songs for the likes of P Diddy, Lil Wayne, and Sean Kingston. Dance act Example was knocked down one place to number two with Changed The Way You Kiss Me, while Calvin Harris featuring Kelis was down one to three with Bounce. The second new entry in the Top 10 was Badman Riddim (Jump) from Dutch dirty house DJ and producer Vato Gonzalez. The track features UK hip hop and grime collective Foreign Beggars and went straight in at number seven. In the albums chart Lady Gaga's Born This Way bounced back to the summit for a second stint at number one. The album spent the last two weeks at number three but hit the top spot for two weeks when it was released in May. Adele still had two albums in the top five, 21 at number two and 19 at number five. Take That's Progress was down from number one to number three. And there was a new entry for Bon Iver with Bon Iver in at four. Other new entries included Planet Pit from Pitbull at 18 and 15 Minutes from Barry Manilow at 20. Jerry Lewis was taken to hospital after he was unable to perform at a show in suburban Sydney, but his publicist said he was simply overtired and was released after a few hours. Glastonbury fell crazy in love with Beyonce as the American superstar brought this year's festival to a close. A famed black-and-red calfskin jacket that Michael Jackson wore in the classic Thriller video has been sold at auction for 1.8 million dollars (£1.1m). Jools Holland is to be honoured for his contribution to music and music broadcasting at a charity event, it has been announced. Glastonbury fell crazy in love with Beyonce as the American superstar brought the festival to a close in "unforgettable" fashion. Beyonce takes to the stage at Glastonbury on Sunday night amid heightened security around the singer's arrival at Britain's favourite music festival. Rock giants Kings of Leon said they can't wait to perform for the Scottish crowd.The US band are gearing up to play a major gig at Edinburgh's Murrayfield Stadium. US rockers Kings of Leon have revealed their biggest worry about their "brutally honest" new documentary was what their grandparents would make of it. Queen drummer Roger Taylor has been beating a drum of a different kind - one attached to a controversial 15-foot sculpture of a naked man.